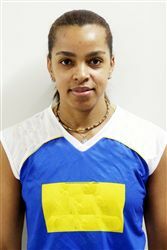 Hélia Rogério de Souza of Brazil, better known as Fofão became one of the well-known female volleyball players in 2008 Olympic Games. Fofão appeared in Olympic Volleyball fourth consecutive time in Beijing 2008. In Beijing Fofão, 38-year-old captain led her team to Olympic Gold medal as a starting setter. She was selected the best setter of the 2008 Olympic Games after superior performance throughout the tournament. Jelena Nikolic is a wing-spiker (outside hitter) for the Serbian women’s volleyball team. The 25-year-old hitter led Serbia to its surprising bronze at the 2006 World's Championships and helped team Serbia to qualify the team for its first Olympics. Teams: VC Takefuji Bamboo (Japan), VakıfBank Güneş Sigorta (Turkey). Brakocevic is born in year 1988 and is one of the future stars of the women’s volleyball. Brakocevic is an universal player and played as an opposite hitter in the Beijing Olympic Games of 2008. Teams: Poštar 064 (Serbia), Spess Volley Conegliano (ITA). Rosir Calderon Diaz was selected the best spiker at the 2006 Worlds Championships. She is one more powerful offensive player to Cuba’s strong lineup. She is the daughter of Erenia Diaz, a former world champion and Cuban women's national team head coach. Height: 190 cm/ 6' 2" Spike reach 330 cm/10' 8"
Keep your eyes on Yimei Wang of China. She has very quickly become one of today's best female volleyball players. This hard hitting woman became a big star in Beijing Olympic Games 2008. 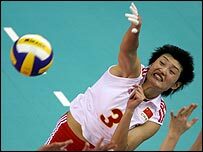 Yimei Wang (born 11/01/1988) made her international debut for the national team 2005. In Olympic Games 2008 this 20-year-old opposite hitter was 2nd best scorer in the tournament! People did not know so much about her before the Olympic Tournament 2008 - now they do for sure. Yang Hao ((Chinese: Pinyin: Yáng Hào)) is a Chinese female volleyball player. Yang currently plays volleyball for club in Liaoning and has played for the national team during many of its recent successes. Chinese team won the gold medal in the 2004 Olympics, where they defeated Russia in one of the most memorable women’s volleyball match ever. Strength of the national team of China is their balanced and well-build team, but if one player needs to be brought up, she is Yang Hao. She has been a leading player for the Chinese national team in its recent tournaments. In 2008 Olympic Games Chinese team placed 3rd. Yang Hao is an efficient server and received the best server of the tournament award several times during her career.